There is a show that claims to present all of William Shakespeare’s 37 plays in two hours. The Complete Works of William Shakespeare (Abridged) by Adam Long, Daniel Singer, and Jess Winfield is performed by three actors. Its performance of Hamlet last only 43 seconds! Of course, the remarkable accomplishment of all the Bard’s comedies and tragedies cannot be covered in such a jocular manner without severe damage to the elegance of Shakespeare’s work. The show is meant as a great joke. Nonetheless, it is a delightful journey in its own right. 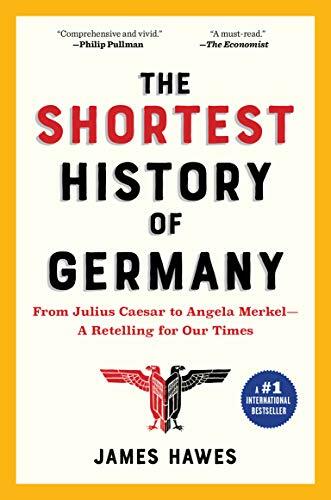 Much the same can be said of The Shortest History of Germany: From Julius Caesar to Angela Merkel—A Retelling for Our Time by James Hawes. The author attempts to collapse 2,000 years of German history into a single volume to be read in “one riveting afternoon” while retaining wine inside the bottle. The effort is valiant and entertaining, but impossible. Each chapter of the Hawes book presents a mere outline of events—mostly of battles and monarchs. We start quite appropriately with the “proto beginning” and end in March 2019 with the challenges facing Germany today. During one tragic era—the Third Reich—Hawes presents greater detail, including some revelations about which even an informed reader might be unaware. Germany did not become a nation until 1871, but the land bounded by the Rhine and the Elbe Rivers had been inhabited for centuries. Julius Caesar, as he approached the Rhine River in 58 BCE, named the land that he would not conquer as Germany. That vast region of Central Europe would influence political life across the continent for millennia. Hawes’ small volume dances from one important historical event to another. Even Hamlet might get fewer than 43 seconds if Elsinore Castle was located in Germany. For someone who knows nothing about European history, the outline would be useful. Hawes should certainly have paused occasionally to tell us what the people were doing while their leaders were starting and ending wars. Teutonic knights, Junkers, Prussian militarists and various kings, dukes and princes parade across little over 200 pages. Hawes’s prose is clear and breezy, and no extra words are allowed. Its pages are filled with maps, diagrams, and reproductions. Themes repeat throughout the book: the importance of religion, the distinction between eastern and western Germany, the overriding importance of the Slavic menace and Russia. Hawes seems to affix much of the blame for Germany’s depraved periods to inhabitants of the predominantly Protestant northeastern territories. There was certainly enough blame to go around and the mainly Catholic remainder of the country was a full participant in the worst of times. European historians will find reason to criticize Hawes’ theses, but for the average informed reader The Shortest History also comes up short. It is not an academic work, although Hawes is on the creative writing faculty at Oxford Brookes University. In Hamlet, Act II, Polonius says, “Since brevity is the soul of wit / And tediousness the limbs and outward flourishes, I will be brief . . .” A good piece of writing should be brief and concise, but it must also be worthy.